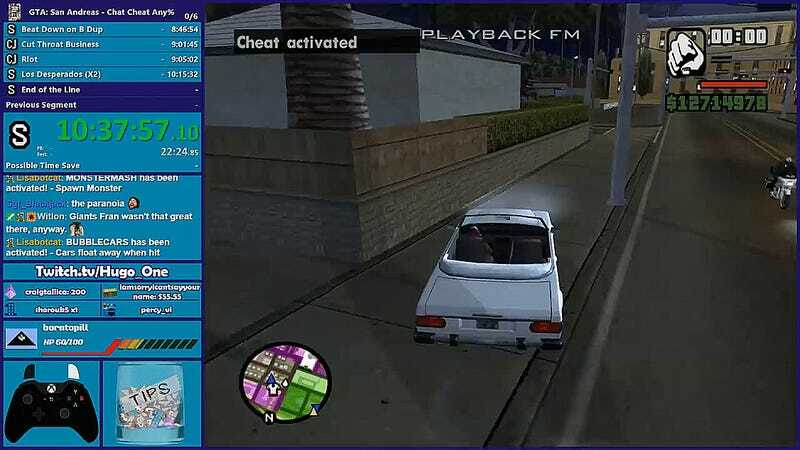 Earlier this month, speedrunner Hugo One streamed himself trying to beat Grand Theft Auto San Andreas. But he made it possible for his viewers to, at any point, activate cheat codes using Twitch chat. The end result is a hilarious speedrun filled with some wild moments. 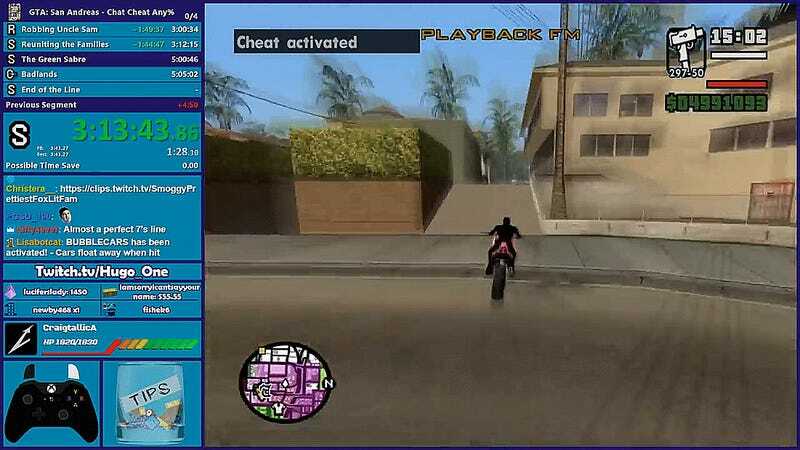 GTA San Andreas, like all other GTA games, includes multiple cheat codes players can activate. These codes can give players extra weapons, spawn vehicles, change the look of C.J. or even alter the rules of the world, making cars hover or pedestrians riot. 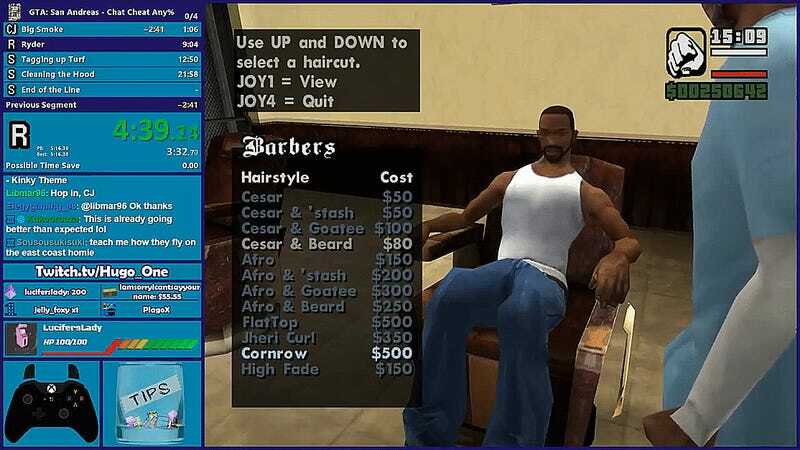 Letting random viewers activate any of these codes at any point in the game adds a whole new level of challenge to completing a San Andreas speed run. For example, at one point Hugo One was trying to complete the valet mission that occurs halfway through the game. In this mission, the player is tasked with parking cars until the District Attorney’s car shows up. Then they place a bomb in it and you can probably figure out the rest. Throughout the mission fans, as usual, tried to stop Hugo One using various cheats. But they were unsuccessful. During the end cutscene for the mission, Hugo One jokingly mocked his fans for “blowing it.” Then someone activated a code that blows up all cars, including the cars featured in the cutscene. This perfectly timed cheat code ended up soft locking the game and forcing Hugo One to load a previous save. Another point, much later in the game, has the player chasing a firetruck. One fan was able to use the code that spawns a tank to perfectly block Hugo One during the high-speed chase. Using a vehicle to block Hugo was a popular way to throw a wrench into his plans. At another point in that same mission, a player spawned a large semi-truck and trailer, which totally block Hugo and caused him to fail the mission. To activate these cheats, his fans needed to use a currency that Hugo One uses for his channel called “duckets”. These can be earned by watching his streams or donating to this channel. According to Hugo One, viewers during the stream activated over 2000 cheats and spent over 10 million duckets. The different cheats would cost various prices, with more powerful cheats like the suicide code, costing 100,000 duckets. The “fight” between Hugo and his fans is not really a serious one. The whole stream is a fun experience between his audience and himself. Throughout the game, his fans find new ways to stop him or hinder his speedrun and through it all, Hugo is (mostly) laughing. Not all users were activating cheats to stop Hugo. Some players would activate cheats just to mess with Hugo or make him laugh. One great moment happened early on. When Hugo took C.J. to the barber shop to get a hair cut a viewer-activated a perfectly timed costume change. Some viewers would even activate codes to help Hugo, sometimes giving him more weapons or fast vehicles or other advantages. Eventually, after spending hours on the last mission Hugo One was forced to disable some cheats as certain viewers were making it impossible for him to finish the game. The entire stream is a really interesting twist on Grand Theft Auto speedrunning and filled with little moments of victory and defeat.